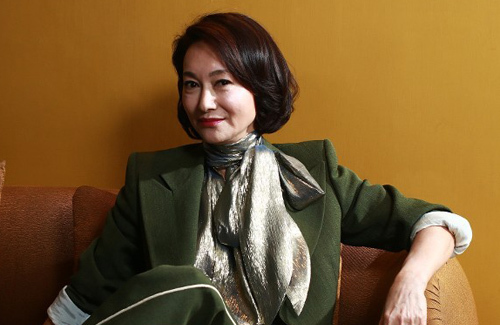 Although the 38th Hong Kong Film Awards concluded last night, and Kara Wai (also known as Kara Hui 惠英紅) once again won Best Supporting Actress, the 59-year-old actress was not always confident that she would win the honors this year. Despite a strong start in her film career and being the very first HKFA Best Actress 1982, Kara experienced some career hiccups that led to depression and a suicide attempt at the age of 40. Regretting that decision in her life, Kara has bounced back stronger than ever. Winning five HKFA awards to-date, Kara has not signs of slowing down. In an earlier interview which took place before Sunday night’s HKFA ceremony, Kara discussed her performance in Tracey <翠絲>, and said she was not fully confident in winning an award. “I do have confidence in myself, but the award depends on the critics’ taste.” Recalling several years ago when she thought she gave an excellent performance in A Chinese Ghost Story <倩女幽魂>, Kara ended up not winning an award that year. Kara’s powerful performance in Tracey was widely recognized, and also helped her win Best Supporting Actress at the 55th Golden Horse Awards and the 13th Asian Film Awards. love her acting. she seems to look better with age.